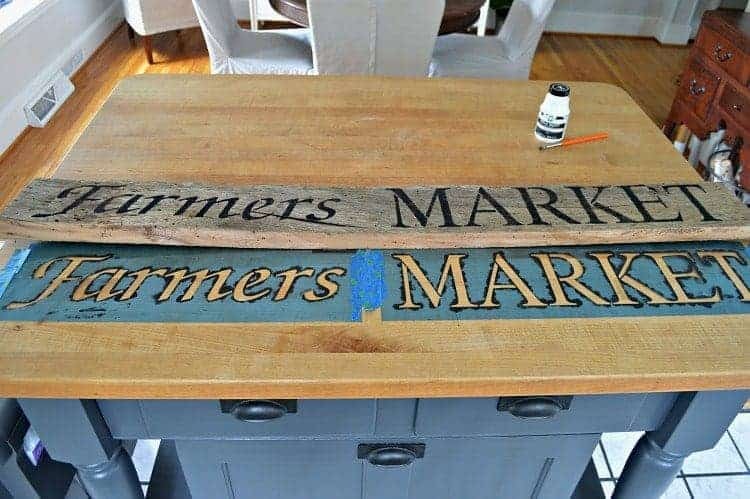 A DIY farmer’s market wood sign for the kitchen. In my last post I shared my new kitchen light and hinted about the one last project I had for this space. 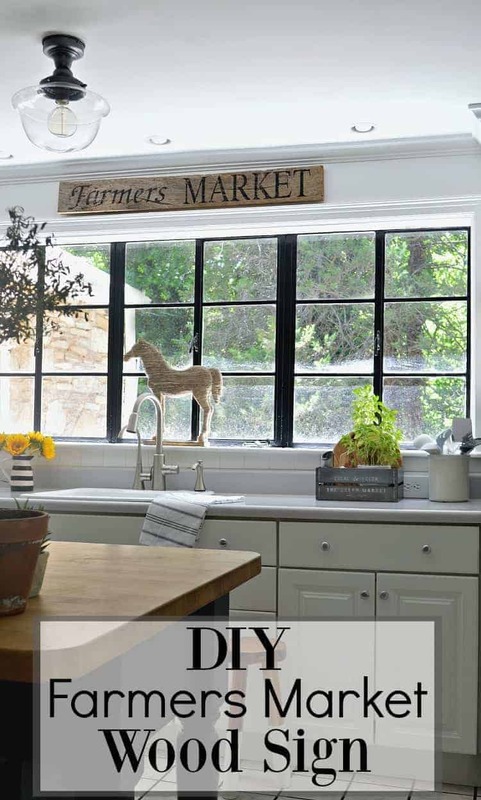 It’s a DIY wood sign that is hanging over my kitchen sink and I think it’s the perfect finishing touch for my space. I’ve known that I wanted to hang something in this spot since we moved in and I’ve been searching, but haven’t found anything that fit. I could make my own and get the perfect size. It just so happened that I had a piece of barn wood that I got from an estate sale for $2. I hadn’t used it for any other projects because it was badly warped and falling apart. I thought I’d give it a shot and, if it didn’t work because the condition of the wood, I would get another piece and try again. I would usually go DIY all the way but there were a few issues to deal with that lead me to break down and buy a stencil. The first problem was that the wood was rough and flaky with a very uneven surface. I did try to use individual stencils that I already had but, because of the condition of the wood, I couldn’t get them straight. I also have very shaky hands so doing any of it freehand was just not going to work. So I bit the bullet and I bought a stencil on Etsy. There’s a ton of sellers who offer these and most will customize them to the size you need. Once I had my customized stencil, my sign came together very quickly. I centered the stencil, using some painter’s tape to keep everything straight, and started to paint. It took 11 minutes to do the whole thing. That’s it! After I was done painting, I carefully removed the stencil and let the paint dry. Once dry, I went over some of the letters with fine sand paper, just to give it more of a rustic look. Then I added the picture hangers and hung it up. I wasn’t sure how my sign would hang with the board being warped, but I think it’s ok. After all, it’s supposed to be rustic, right? 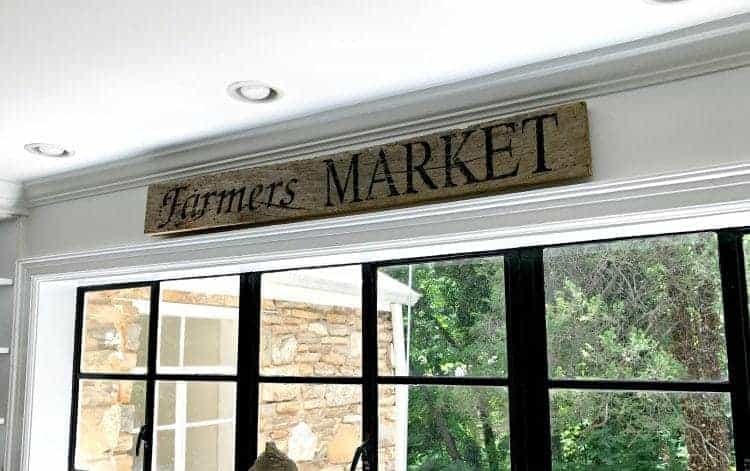 Now that my farmer’s market sign is hung, I can officially call the kitchen done. Check out a couple more projects I’ve completed to put this space together. Lovely! I have just such a spot that needs something, AND the weathered, splitting, warpped wood! Now to find the stencil I want. Ah, sounds great Nancy! So many great stencils out there. Such an easy project and I’m thrilled with the way it turned out. 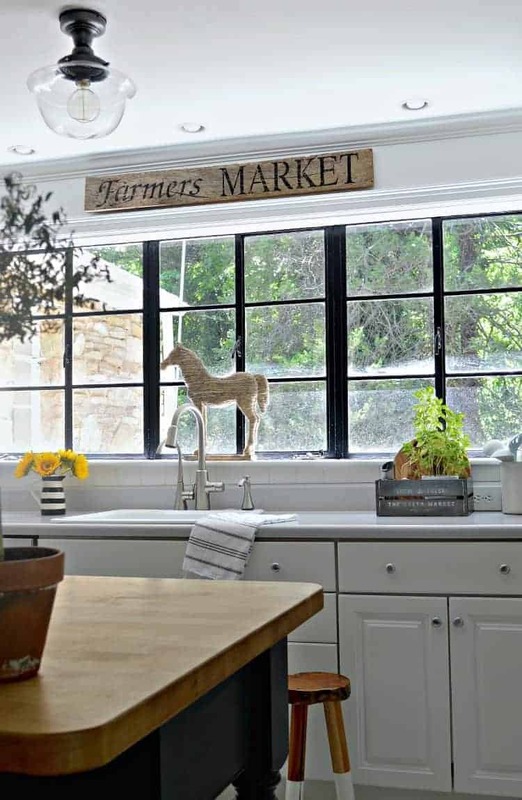 I love your barn wood sign as well! I looked on etsy and I didn’t see the same stencil. Do you recall which seller you bought it from? Thanks for your time! She was great to work with and gave me the size I needed, which was larger than usual. I’m sure you any seller would do what you want but I would use Superior Stencils again. Hope that helps! Thanks so much Nancy! It took a while to get exactly what I wanted, but it all worked out in the end. 🙂 Hope you enjoy the rest of your weekend! Oh my goshI just love your sign! It is perfect for that spot. That sign is just perfect in that spot! Can you tell me where you got the great horse? Thanks! He ended up being a lot bigger than I had thought but I’m enjoying moving him around from place to place. Great sign. 🙂 Your project turned out so nicely. Love the sign and love the horse too, they look very nice together. Also love your great big window. I wish I had one this big as I saw a photo on pinterest with two bigger/ taller (maybe buffet) lamps on either side of the sink near window edges…just loved it and I am a huge fan of lamps in the kitchen, I could still do it, but if my window were bigger….anyway, your kitchen is so pretty and I like it all. 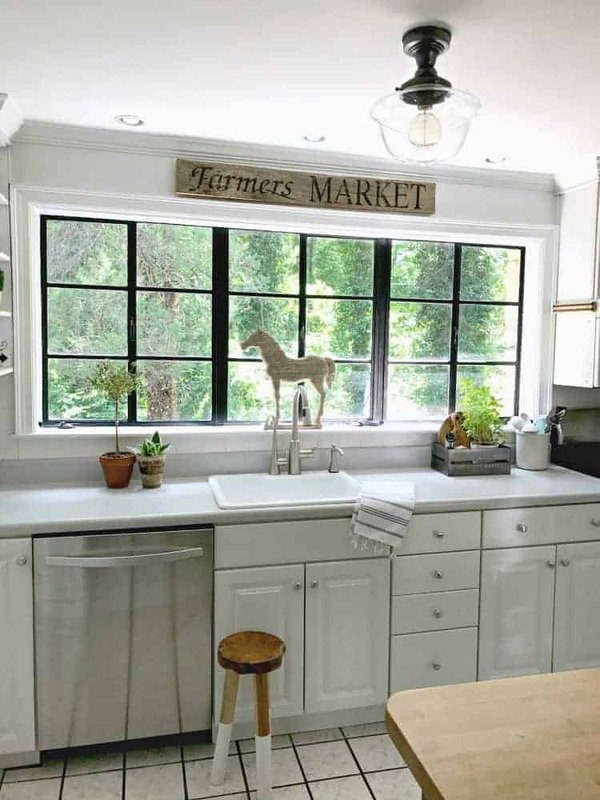 Perfect final touch, especially with the black framed window and horse. Thanks so much, Pat. It’s all about the window with me. You could say I’m a bit obsessed. 😉 Hope you have a great day! Everything you’ve done is just great! Love the sign…thanks for the tip on finding stencils on Etsy too! Thanks so much Phyllis, I appreciate it. 🙂 I actually buy a lot of things on Etsy. 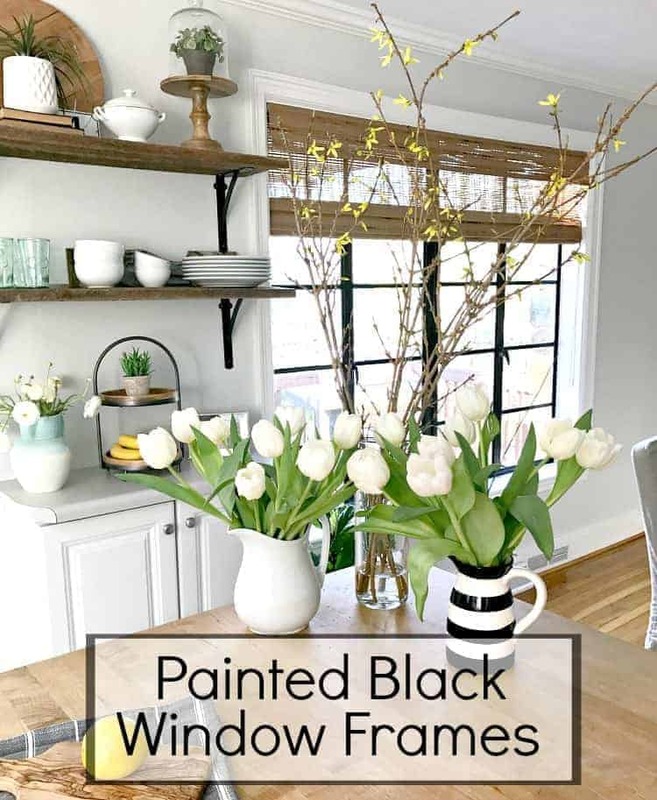 It’s a great source for all things home, and the prices are very reasonable. The sign is great! I love your kitchen and dining area!! You did a wonderful job. Your cottage would be just perfect for my husband and myself. We are thinking about downsizing, and your home is wonderful!!! Thanks so much Sue. I love how the whole space turned out. I’m still getting used to downsizing (it’s been 4 years and 2 houses) but it definitely has it’s advantages. We’re still in the stages of cleaning up the yard and fixing up the house but, once that’s done, we’ll be able to enjoy it more. Thanks for stopping in. 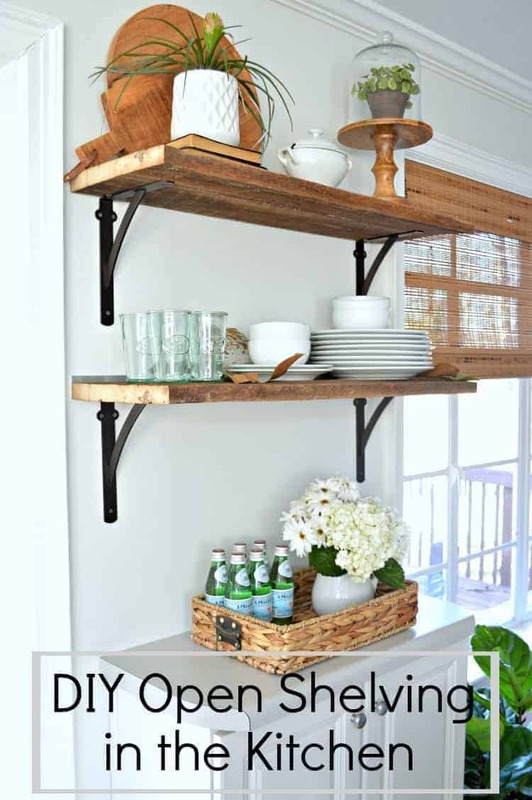 Hi Kristi, what a great DIY project to compliment and complete your beautiful kitchen! 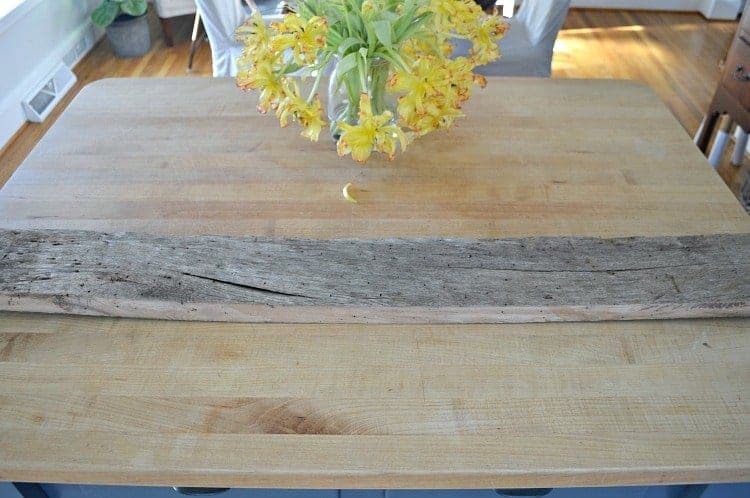 I love the barn woods “natural” state, the color, the warps, imperfections and generous size are just perfect! I love, love, love it! Awww, thanks so much Kaycee. I was sure that that imperfect piece of wood was destined for scrap. I’m glad I experimented with it and gave it a new life. I always appreciate your visits. The sign is a perfect addition, along with the horse! Just ties it all together! Just found your blog. Would like to know more about the horse. My grandchildren LOVE horses and it would be ideal for them. Hi Arilla! So glad you found us. That horse is a favorite of mine. So glad you like him. I believe that I got it from Wayfair. If you click on the Shop My House tab at the top of my blog, you’ll find a link that will take you right there or you can click on it here (https://www.chatfieldcourt.com/shop-my-home/). It is an affiliate link so I will get a commission if you buy it but it won’t cost you any extra. Hope that helps! It’s perfect, warp and all. Again, love your little home so much. It’s warm, cozy and soooo inviting. Awww, thanks Pat. I thought the warp would bug me but you can hardly tell with it hanging up. I guess you never know. 😉 Hope you have a great Wednesday! I LOVE your wooden wooden sign. 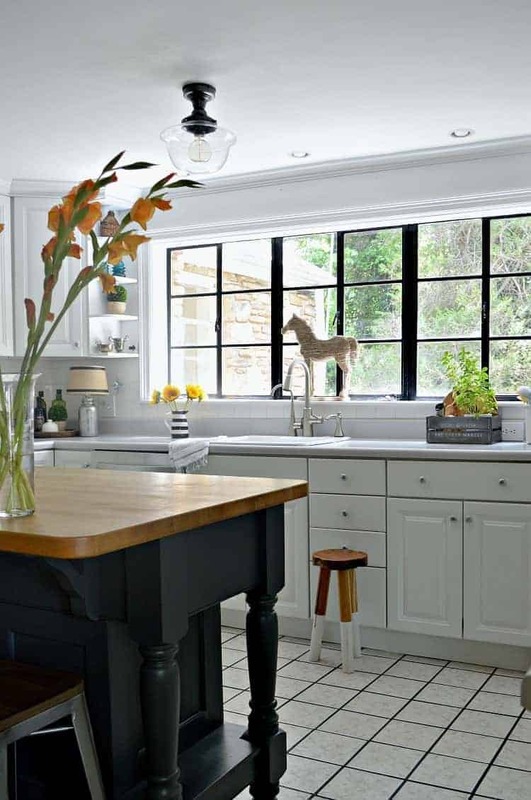 Your kitchen looks fabulous and it must feel so good to have that area completely done. Can’t wait to see the next project that you tackle. That looks so good, and practically cost nothing. I had a wood piece similar to yours and I hand painted a celestial welcome sign using a separate sun wood piece. It took a lot more time, but cost almost nothing as I had everything on hand. It’s amazing what you can find in your stash! I love the sign and your light fixture! I have some old wood in the basement so I just may give it a try. Thanks for the inspiration. ?